Half a million people worldwide joined The Ocean Conservancy International Coastal Cleanup and raised awareness about the human impact of plastics on our oceans. A bold new initiative on the world stage occurred! Ocean Conservancy, the Trash Free Seas Alliance®, and Closed Loop Partners, with the support of world leading brands—including Procter & Gamble, 3M, PepsiCo and plastic makers from the American Chemistry Council and the World Plastics Council—will create a new funding mechanism to raise over $150 million in the next five years targeted to improve waste collection, sorting and recycling markets in Southeast Asia (the world’s biggest polluters). This combined effort helps reach a goal of cutting the amount of trash entering our oceans in HALF. Many years went into working on this issue. Because of this year’s support, The Ocean Conservancy was able to show the world that the public stands behind their dream of trash free seas®. There are some very environmentally destructive companies making an effort to partner with environmental groups involved in this important cause. Visit their website to learn more. 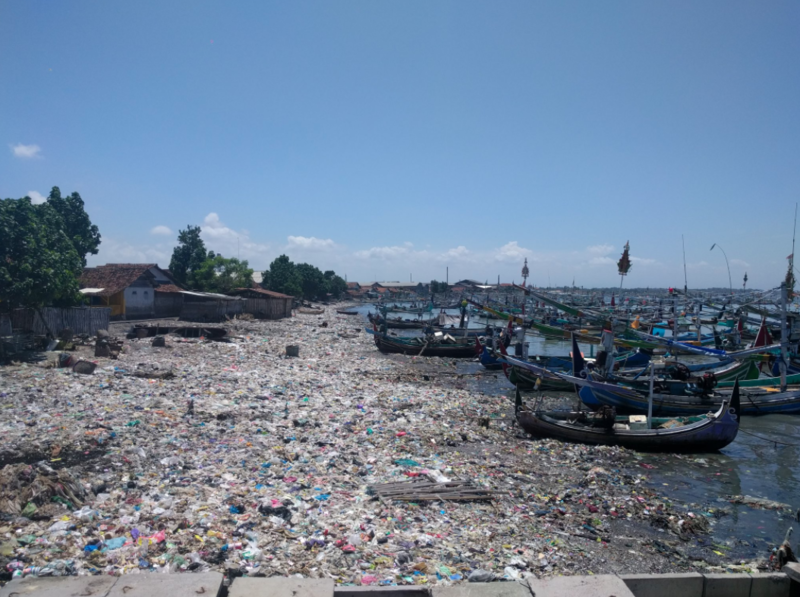 Of the top ten countries responsible for plastic waste entering the ocean, six are in Asia, with China the top offender producing 2.22 million tonnes of plastic waste every year, and Indonesia second at 1.29 million, according to Surya Chandak, a senior program officer at the United Nations Environment Program, quoted in local media. Chandak cited the region’s growing economies and populations as prime culprits. The Philippines is third, Vietnam fourth, Thailand sixth and Malaysia eighth. Miss Oceans Vietnam was designed to draw attention to the plastic pollution problem in the South China Seas. Another OWM Hall of Shame culprit is NY’s famous Pizza lovers. You know you are one block away from a Pizza Parlor when you start to see the plates littered along the sidewalks and streets. It must take the same amount of time to walk one block as it does to enjoy a slice. The plates make NYC’s sidewalks awash with white holes. These eight were from my Monday morning walk to the subway. Tuesday’s collection on the same walk. The last one is my favorite! That plate is now a permanent part of the sidewalk. Wednesday’s walk was mostly about picking up plastic before the rainstorm but there were still enough holes to get eight more photos for the collection. Thursday’s walk yielded some doubles. How does New York’s Bottle Bill work? New York State’s Returnable Container Act requires every deposit initiator to collect a $.05 deposit on beverage containers containing less than one gallon of carbonated soft drinks, beer, malt beverages, wine coolers or water, sold in New York. Dealers (“retailers”) pay the distributor or deposit initiator at least a 5-cent deposit for each beverage container purchased. Consumers may then return their empty beverage containers to a dealer or redemption center to get their deposit back. Retailers and redemption centers are reimbursed the deposit plus a 3.5-cent handling fee by the distributor or the deposit initiator for each empty beverage container returned. What beverages are covered by NY’s Bottle Bill? What beverages are not covered by NY’s Bottle Bill? Let’s look at what is littered on our streets from Gatorade and Arizona Teas. Both companies do not have deposit agreements with NY. I encounter this litter everyday on my 15 minute walk to work from Clinton Hill to Downtown Brooklyn on Dekalb Ave.
Take a moment to learn which companies have deposits for your state. It makes a difference. The consumer deposit tax is not the best system to protect our environment but that is a topic for another blog. These are a few of the items Martin found during our cleanup of Canarsie Pol in Jamaica Bay. You have to wonder what happened to Marcus Nigel Nicholas. Did Ashley Carvalho and Cassidee Bush need multiple copies of so many credit cards? Did they contact all of those banks that the cards were lost? They all have security codes on the back signature strip. Are they legitimate? When I Googled fake credit cards with security codes…I was impressed with how many ways you can get a fake credit card. Don’t trust a site just because it claims to be secure. The URL is important. It needs to state https://. If it only states http:// Do Not Use It. My friends, Niovi and Sam, have hosted many a Coop party by using cocktail glasses that reuse their cocktail’s main ingredient; preserves. They are definitely onto something as mixologists all over NYC are using this ingredient to add sugar, flavor and citrus to their favorite spirit. Cocktail science is a blast!!! I thought it would be great to create a Hall of Shame page on my header. This will include companies who have products that create waste. The example above is a single use plastic bag that is distributed every week with filler ads to our door X 6 units in our building. Every week it gets thrown away. The advertisers on the plastic bag need to rethink their PR. Our building needs to post a sign. According to http://www1.nyc.gov/assets/dsny/about/laws/posting-and-graffiti-laws.shtml, it is illegal for any person to place or allow to be placed any unsolicited advertisement where the property owner has posted a sign, at least five inches tall by seven inches wide, with one inch letters stating: “Do not place unsolicited advertisements on this property.” In a multiple dwelling building, each unit owner or lessee must consent to the posting of the sign. In a multiple dwelling building, the property owner may designate a place for the placement of unsolicited advertisements. Violations of this section shall be enforceable through property owner complaint forms submitted to DSNY by property owners. The complaint form may be obtained on DSNY’s website or by calling 311 or visiting nyc.gov/311. I think I would like the job of enforcing litter laws!